Description: Conrail had a constant parade of van trains at all times of day and night. This one is eastbound through the ex NYC station late in the day. Description: TV 26 passes wildflowers and the pond along Watson Blvd in Endwell NY with 10 COFC and 61 racks. Description: DABU passes Ted Clarks Busy Market and under US 220 in Waverly NY as it chases the setting sun under a dramatic sky. 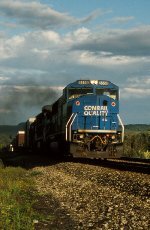 Description: DABU rolls around the curve and past the old Erie station at Chemung, seen from NY 427. Description: DABU pours it on as it rolls through Smithboro. Description: WABH 11 works at American Pipe and Plastics in Kirkwood, delivering the cars that make the railroad their revenue. We all love seeing the big main line trains, but without these guys handling the single cars to the customer, there are no big main line trains. Description: Conrails local WABH 11 had the chores in the Binghamton area, working between Kirkwood and Endicott on the Tier, and the Vestal Spur, the remnant of the DLW main. Today its down at Willow Run Foods and the American Pipe and Plastics plant, where we see it working. 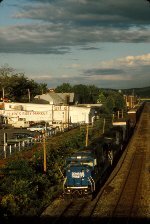 Description: OICA-8 passes Yardley station before the SEPTA "makeover"